The springs on Supervisor Eugene Delgaudio’s 2002 Ford Focus were crushed, he claims, from the heft of years of board meeting minutes strewn in his trunk. Soon, Delgaudio (R-Sterling) will join the seven supervisors who made the switch from paper to iPad late last year after a county administrative office’s initiative to abate the amount of packets distributed to the board – saving paper, time and money. The Apple iPad, which was introduced in January 2010, is a tablet computer that has an operating system that falls somewhere between a smartphone and a laptop computer. Supervisors receive minutes, agendas and supplemental packets for board and committee meetings as well as public hearings on a near weekly basis. All together, the packets can measure 6 inches to a foot thick, said Supervisor Jim Burton (I-Blue Ridge). But, Burton was relieved of his backbreaking board packets when he switched to the iPad in November. The iPad hosts the board’s current meeting documents as well as all previously archived packets. It also furnishes the supervisors with the ability to take notes and mark-up the document’s pages, said Danny Davis, chief of staff for county administration. Still, glitches happen. Davis admitted there have been some discrepancies between page numbers on the paper versus iPad versions. Delgaudio has several times handed over his hard copy version to a supervisor who can’t find the page they’re looking for during a meeting. 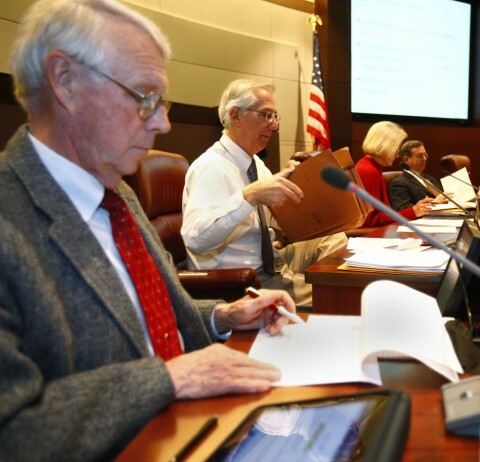 Davis, who gave a brief training session to each supervisor when they received it, pushed for iPads for the board when he heard of other Virginia jurisdictions utilizing the technology. The city of Williamsburg and other Hampton Roads area jurisdictions also use iPads, he said. But, the iPads don’t just prevent sore muscles, they save time and money. The administration office took a “back of the napkin” cost analysis of an iPad versus paper packages, Davis said. They outlined how many pages are printed, the cost of printing and distributing them and the use of staff time. “It very easily pays for itself within a year, if not less than a year,” Davis said. Each iPad for the nine supervisors costs $800. On the other hand, printing costs 10 cents per page for an average of 75 to 400 pages per packet for each supervisor, of which thousands are distributed annually. Additionally, every time the courier service is used, it charges the county $100 regardless of whether a single page or hundreds of pages are delivered, Davis said. Cheaper iPads are on the market, but the supervisor’s tablets have the necessary amount of memory to support their lengthy documents. The iPads also have 3G access, which is a wireless technology that provides Internet access in any location. Supervisors Delgaudio and Sally Kurtz (D-Catoctin) are the last to receive the iPads, which will be in hand in coming weeks. Delgaudio said he wanted to wait until the county’s website provided an iPad (which he intermittently refers to as an iPod, which is Apple’s portable music player) application for the general public. All board documents are downloadable on the county’s website. “[The iPad] will save money and it will save time,” Delgaudio said. For his part, Burton said he’s already told county staff not to ship paper packets to his home anymore. He’s trying to clear them out to make way for his new tablet. “I’m to the point now where I can almost see the top of my kitchen table,” he said. Burton claims he’s still going through a learning process and that there will be hiccups in getting used to the technology. But, he’s especially pleased that he can go back to review items, data and reports so easily.